STAY Project Members sharing stories about identity and home around the fire at the STAY Summer Institute. Appalachian South Folklife Center, Pipestem, WV – Aug. 2017. Photo by Lou Murrey. That country was beautiful, I swear to you, the most beautiful place I’ve ever been. Beautiful and terrible. It is the country of my dreams and the country of my nightmares: a pure pink and blue sky, red dirt, white clay, and all that endless green—willows and dogwood and firs going on for miles. Dorothy Allison, "Two or Three Things I Know for Sure"
These are complicated times for those of us who work in stories. Writing, publishing, and documenting our world has never been uncomplicated work. But these days we live amidst so much media. Layers and layers of voice, image, emotion, opinion, chatter. Constant dialogue, constant disagreement. The question of who we listen to—whose voices we value, which stories we pay attention to and why—seems to be growing more crucial by the second. This question has never been apolitical. It is wrapped up in power and class, race and gender, geography and social capital; it is inherently linked to ethics and values, to questions of justice. In the past six months, I’ve learned of five separate initiatives launched by national news platforms to cover the rural South, and specifically rural Appalachia. Yet none of them deeply engage with the historic injustices and damage that national media has caused my home. None of them acknowledge the complexity of covering a region that has a deep, well-earned mistrust of mainstream media. I’ve seen national media portray West Virginia—where I was raised—and eastern Kentucky—where I now live—as the home of racist white voters, as a place of despair and conservatism, as a wasteland of drug epidemics and pollution. I’ve seen national media swoop in every four years for presidential campaigns, or stop in for a short story about the “drug overdose capital” of the country. I’ve seen national media seek out stories that fit a narrative they wrote long before their reporters set foot on mountain ground. What I’ve almost never seen is national coverage that portrays this place as the home of rich legacies of radical labor organizing, environmental organizing, and queer organizing, as the soil for rich artistic and literary traditions, as a region shaped by patterns of in- and out- migration, as a place that is complex, varied, diverse, and full. Since November 2016, those of us in Appalachia have heard over and over again that it is all our fault—that Trump never would have won without the racist, poor voters of the coalfields. To be sure, there’s a truth to the ways in which my home influenced the election, to the ways in which white supremacy is bred in this place. But, there’s a gaping hole in the story when national media chooses to locate racist white voters only in these mountain hollers, and not also in the wealthiest neighborhoods of every American city and suburb from the South on up to New York and Boston. A less-documented truth of this place is that people of color have always lived in these hills, that voter suppression exists here too, that there are thousands of Black and brown folks incarcerated in these mountains who’ve been robbed of the right to vote, and that many Central Appalachian residents struggle to make it to the polls due to lack of transportation, childcare, gas money, and time off work. There are many truths to this place, all equally worthy of ethical, nuanced, in-depth coverage. There is a comfort—or so I’d imagine—in being able to locate all that ails our country somewhere else. Somewhere you don’t live, somewhere you don’t know anyone, somewhere represented as so different from your own home that you could never find common ground with those who live there. You imagine that you have no responsibility to this place, no accountability, no relationship; the perfect closet for the nation’s skeletons. This country needs the rural south, and Appalachia specifically, as an ‘elsewhere’ for its problems. But our problems are national problems. That gets denied when ‘coverage’ of this region amounts to outsiders packaging up familiar narratives and selling them to audiences who are most comfortable ignoring the many conflicting, overlapping, layered realities of this place. What we never see in national media is writing by, about, and for Appalachian people—coverage that respects people from this place as the experts of our own lives, communities, and histories; writing that lifts up Appalachian people as complex, varied, brilliant, resilient, and diverse. So, I, like a long line of Appalachian folks before me, am not just wary but thoroughly skeptical about many of the new rural reporting initiatives launched by national media outlets. Until they boldly engage with the history of journalism’s offensive and destructive coverage of my home and the rural South more broadly, and until they work to foster and support Appalachian writers to tell our own stories— I want little to do with them. Out In the South - Central Appalachian Regional Gathering at Highlander Oct. 2017. Photo by Lou Murrey. In 2003 I took three trains from White Sulphur Springs, West Virginia to Amherst, Massachusetts. I showed up late to college orientation, without a pillow. I learned quickly that the South was universally “not cool” to my peers from coastal cities and the Northeast. We were—in their eyes—the only home of racism, homophobia, and religious conservatism. “You can’t be from West Virginia dressed like that,” a gay boy from Chicago told me as I left an event in formal wear. “West Virginia is one of those places I don’t even feel like exists,” a fellow student said. By our senior year, in 2007, the South had become really cool. Wealthy white students from California, New York, Boston, and New Haven started saying “y’all” like they’d grown up in Georgia. People who’d never been to the South started talking about the importance of Southern organizing. And while I’d agree that the most imperative and sharpest organizing has always come from the South, these remarks felt less like a celebration of anything actually happening in the South, and more like the hip thing to say. Turns out, the whole nation took up this ongoing love affair with the images, icons, tastes, and politics of the South—so long as their shallow engagement with the South confirmed their sense of self. You imagine that you have no responsibility to this place, no accountability, no relationship; the perfect closet for the nation’s skeletons. This country needs the rural south, and Appalachia specifically, as an ‘elsewhere’ for its problems. In a college graduation card, a friend from a major city wrote, “Do you remember when you showed up as a farm kid from West Virginia who didn’t know anything about anything? Well, I think you got a whole lot smarter!” It was meant as a compliment, but it haunts me, over ten years later. It’s true, I learned a whole lot about race, gender, sexuality, social justice, art, theory, organizing, food, and my own queerness at college, among other things. But this doesn’t mean that my city-raised peers didn’t learn about these things as well, or that college didn’t challenge their preconceptions, open up their worlds. What they didn’t learn was the knowledge that I, and a very small number of other rural-raised Appalachian and Southern kids, brought to college—unique practices of farming, of livestock management, of navigating difference, of wild plant identification. Most important, a uniquely Appalachian way of listening. This wasn’t seen as knowledge. You can’t put this experience on a résumé. Rural wisdom isn’t valued in a national intellectual landscape, isn’t visible to the national media, and therefore to the nation. Join the author, along with Elizabeth Catte and the team at Appalshop, in a conversation about community-accountable reporting at this event in Whitesburg, Kentucky. I moved to Austin, Texas after I graduated college, convinced that my peers were right, that I couldn’t have my queerness and hold on to my home, the mountains I love in a way that is near impossible to put to words. I became a regular at a gay country bar, trying to mend the divide between the place I was raised and my present. We were a jumbled mix of mostly rural, mostly homesick queers building community, demanding that we could be country and queer too—even in a mushrooming city. In April of 2010, still in Austin, I read emails from home about the Upper Big Branch Mine disaster in Raleigh County, West Virginia. The coal dust explosion killed 29 out of the 31 miners working that day. It was the worst mining disaster in the U.S. since 1970. I told my partner at the time, a country and bluegrass musician who, along with her country and bluegrass peers, played many a song from the West Virginia coalfields. “Wow,” she said. “I didn’t think that kind of thing still happened.” No one else in Austin ever mentioned the explosion. I’d watch wealthy musicians from Houston sing “Coal Tattoo” because it was a “high energy crowd pleaser.” They’d smile and tap their boots, and I’d boil inside. After ten years of aching for the mountains, I moved home to West Virginia. It was complicated and it was wonderful. I found a grounding, a re-rooting, a sense of rest and purpose and trust I’d never known as I walked the ridgelines and creek beds of the land that raised me. I found isolation and a void of queer visibility, too. I grew deeply frustrated at the lack of accessible examples of rural queer life beyond the infamous stories of Brandon Teena’s and Mathew Sheppard’s murders. This frustration led me to launch a multimedia oral history project called Country Queers, in an attempt to find other rural queers, to lift up our stories of struggle and trauma, of joy and contentment in our rural homes. Ash Lee Henderson at Highlander Homecoming leading "We Shall Overcome" Sept. 2017. Photo by Lou Murrey. On January 9, 2014, 7,500 gallons of 4-methylcyclohexanemethanol (MCHM) leaked from a Freedom Industries Facility into the Elk River—upstream from the main West Virginia American Water intake, treatment, and distribution center. Crude MCHM is a chemical foaming agent used in coal processing to remove impurities that contribute to pollution during combustion. By the next evening, nearly 700 residents had contacted West Virginia's poison control center, reporting a range of symptoms including nausea and rashes. The Elk River Chemical Spill left 300,000 people in nine counties without safe drinking, cooking, or bathing water for weeks. During that time, I traveled to Houston for a national LGBTQ conference. No one there had heard of the chemical spill. All of the workshops about supporting LGBTQ youth in public schools or showing up as a white anti-racist ally centered the experiences of folks living in major liberal bubbles, who could be fully out at work, who assumed that was the end goal. I called a friend back home, sobbing. “I feel like I live on a different planet than everyone else here,” I said. “You do,” She told me. The chemical spill was the third to occur in the Kanawha River Valley in five years. Less than six months later, a fourth occurred at the same site. When I mention the spills to folks outside of West Virginia or Eastern Kentucky, few have ever heard of them. Marie Webster tills up earth for a community garden at the Clearfork Community Institute in Clairfield, TN. Photo by Lou Murrey. The current post-election wave of rural reporting initiatives reminds me of when Connecticuters started saying “y’all.” It’s hip right now. And, Appalachians have seen this pattern of national interest wax and wane before, as the media locates a crisis in the region (such as rampant poverty during the War on Poverty—and ever since) or blames a crisis on the region (such as white supremacy and the rise of Trump in more recent months). Even these inaccurate narratives rarely stay focused on us. And we never hear first-person narratives of our crises or our joys told by and for rural Appalachian people. We need more deep, honest, and complex stories from rural places in the United States, and specifically the Rural South. I appreciate that other folks throughout the U.S. are starting to realize this too. But what’s missing from almost all of the projects I’ve seen so far is real leadership by rural folks. Leadership which positions rural people as not only subjects, but agents of change-making, as bearers of deep wisdom, as articulate experts with lessons to share, not only with other rural folks, but with readers and viewers across the country. True rural leadership requires much more than developing an initiative in a major city and then hiring a local or transplant reporter for minimal pay. Until reporting initiatives boldly engage with the history of journalism’s offensive and destructive coverage of my home and the rural South more broadly, and until they work to foster and support Appalachian writers to tell our own stories—I want little to do with them. A rural reporting initiative that would have my support would be one developed and led by rural people. One which produces stories of, by, and for rural people. One which values rural people as the experts of our own lives, communities, economic, religious, political, and environmental realities. One which lifts up and supports the rural writers, media-makers and journalists already doing this work, who currently do it for little pay and no recognition. One in which publications and organizations outside our rural landscapes ask us what we would like to see covered, and by whom - and then leverage their national networks and funding to make it happen. One in which mentorship and training is offered freely, to skill up new young writers, reporters and media makers in local communities, while mentors listen to their wisdom about how to ethically document their homes. Members of Sustainable Equitable Agricultural Development Taskforce in East Tennessee strategize around their rural broadband campaign. Narrow Ridge Earth Literacy Center, Washburn, TN. Photo by Lou Murrey. There are examples of how to do this work well. Last year, I started working at Appalshop’s WMMT Mountain Community Radio, in the coalfields of eastern Kentucky. 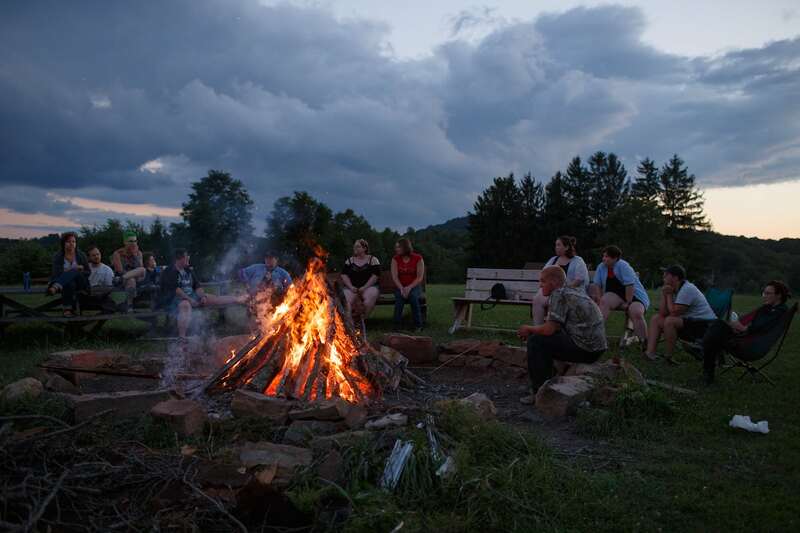 Appalshop has long been known within the region as a leader in place-based first-person narrative by Central Appalachian people in the coalfields. Projects like the Appalachian Media Institute—a youth media arts program training up young folks to tell stories about their eastern Kentucky communities through film, photography, and audio—provide excellent examples of how to support local rural folks in telling our own stories. Rural reporting initiatives need not reinvent the wheel, but in order to know that, they’d need to do their research first, to seek out examples of rural media-makers and organizations to learn from. Rather than launching a project from a coastal city to educate urban liberals about “Trump Country,” these initiatives should begin from a place of listening, asking, and learning. Let rural communities guide the development of rural story work. Fund organizations and individuals already working to produce ethical, stories grounded in our homes. And use outside resources to support us in developing reporting initiatives that are meant to serve us, not simply explain us to an outside audience. We need more deep, honest, and complex stories from rural places in the United States, and specifically the Rural South. The rural South is so many things, so many stories, so many contradicting realities existing at once. We hold deep wisdom about community support networks, disaster preparedness and response, wild foods and small-scale sustainable homesteading, maintaining relationships of respect and even love across difference, extraction, addiction, celebration, faith, music, culture, and resistance. Until national coastal media producers look to us for answers, wisdom, and guidance—and see us as the tellers of our own tales—the only thing I expect from these new initiatives is a centuries-long pattern of flattening the rural mountain South. *An expanded version of this piece will appear in Issue 13 of Scalawag’s print magazine. Subscribe here. Columbus County, North Carolina faces steep challenges in treating mental illness and addiction. In this series, we examine the roots of the problem and the interventions that can help. Today: how the health system came to fail so many.